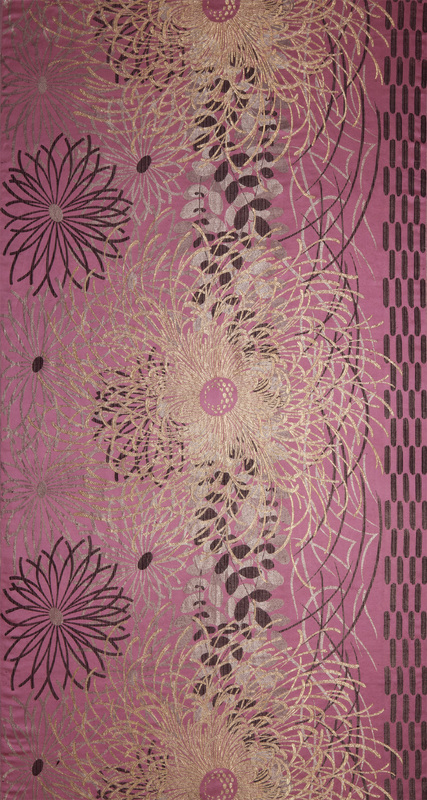 Pink silk satin ground with gold and silver lamé; patterned with motifs of chrysanthemum and leaf of lespedeza (“hagi”) woven by liseré and broché techniques; pattern repeat L. 100cm. Large crysanthemum flower motifs with long, thin irregularly-arranged petals are placed on a background incorporating a different crysanthemum variation and a band of lespedeza (“hagi”) leaves. All these motifs reference traditional Japanese patterns. Henry Bertrand began his career as an apprentice silk weaver for the French company Grand Frère, and established his company near Lyon in 1885. Lyon had been at the center of the European weaving industry since the 17th century. It provided an environment where weavers competed keenly in terms of artistic character and quality, and were sharply attuned to global trends in culture and diversity in decorative arts, working to meet the needs of clients in those areas. This textile uses traditional weaving techniques, but the design is heavily influenced by Japonism, which was seen as being highly innovative at the time. Textiles with the same design but different ground colors are held by the Musées des Tissus et des Arts Décoratifs de Lyon (Inv. 30370) and the Cleveland Museum of Art (Inv. 2003.42).